Time to reevaluate Leo’s last stand? Excellent build with more of a nod to Leo’s finest moment. Can’t swap out the pickups. It’s been quite a while since this writer has had his hands on a USA-made G&L, and on first impressions there’s something very vintage-y about this guitar, as if it has been laid in storage since the early 80s. The truth is, while G&L (rightly) has a large fanbase, its original models seemed to almost place function over form and style, and even back in the day they seemed slightly at odds with where music was heading. Is it any different today? Let’s take a look. Obviously, this model is based on Leo’s masterstroke design and - as many contemporary designers have found - improving on a ‘perfect’ design isn’t easy. 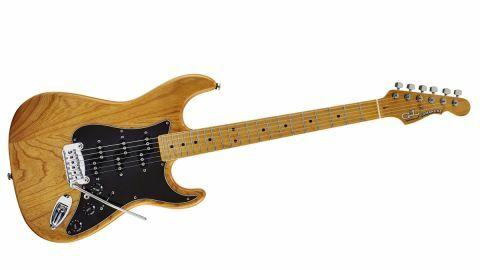 Whether or not the Comanche improved on the Stratocaster is not actually the point: the design illustrates the restless spirit of Leo Fender. Virtually every part of his Stratocaster has been tweaked, from the body outline to the control circuitry, creating a hugely familiar but different tasting dish. The Comanche’s body, by design, is clearly Strat-like with a very similar outline. The 44mm-thick ash body is, when viewed from the base, a three-piece spread that’s very cleanly joined. In fact, looking from the front on the treble side it’s hard to see a join line at all. Contouring is quite deep on the back, too, and the tinted gloss finish to both body and neck certainly supports that ‘time capsule’ vibe. The Neck is maple, of course, and rift-sawn where the grain is at a diagonal to the headstock face. As a result, there’s some subtle flame on the bass side of the Comanche’s neck. But today’s construction is more conventional with a separate maple fingerboard on the Comanche. The Comanche’s headstock is Strat-like. In terms of hardware, the Dual Fulcrum vibrato was very much a part of the improvements Leo Fender made to the original G&L guitars. It takes that classic design and runs with it, using two sturdy Allen-key height-adjustable pivot posts, brass saddles with a large central hole, and nicely shaped ramp leading up to the break point of each. The hole from which the strings emerge has a slightly radius’d edge - the block is apparently brass and you can see the anchor holes are drilled deeper into the block than on a vintage- style vibrato. Height adjustment screws sit well inside each saddle. Only the collar that holds the arm looks a little oversized, but it not only offers tension adjustment but also provides a very firm positive drive. Another bit part of the original G&L guitars were the MFD (Magnetic Field Design) pickups for which Leo Fender was granted a patent in 1980. Various types have been used over the years and here the Comanche uses perhaps the most visibly out-there Z Coil version, which refers back to the classic Precision bass pickups: two coils in that classic offset with the bass sensing coil heading towards the neck. If there are some oddities to the designs, both share a very good weight and come with very similar necks that are on the thinner side, depth-wise. There’s less taper than many, too, so the neck doesn’t get over- deep in higher positions. The feel is pretty similar to Fender’s Professional series, for example, with a depth of just over 21mm at the 1st fret slightly, filling out by the 12th fret to approximately 22.5mm, whereas the American Professional gets a little deeper at around 23.5mm. We’d call it C profile with a little shoulder, and that gloss polyurethane is actually quite a welcome change from bare wood, satin or often sticky nitro gloss. Warming up our test amps with a pair of Strats then plugging in the Comanche, we’re in for a different ride. First up, there’s less hum in front of either our computer monitor or from the mains transformers in our amps. The trade off is a slightly darker voicing at the neck (less so the bridge, although there’s a definite touch of Telecaster here) and quite a humbucker-ish tonality. Pulling back the bass-cut control thins that slightly for a more conventional Strat-like voice, but can make the bridge rather too thin and spiky. But restore the bass, then pull down the treble control, and kick in a crunchier amp tone, and again we move into a more conventional humbucker-like voicing that’s some way off ‘classic’ Stratocaster. In fact, it’s all too easy to get side-tracked as you explore the tone options. The bridge and middle mix, for example, has quite a honk to the expected hollow flavour, giving a little more poke that’s useful for dirtier funk rhythms. The neck and middle is softer, but again there’s a darker character here that takes a little while to get a handle on. It’s definitely a ‘Fender’ you’re hearing, but with considerable tonal shade. Smartly made and now more smartly priced thanks to direct-to-dealer pricing in the UK, G&L is clearly pitted directly against Fender’s USA production lines. But unlike so many Fender-alikes out there, not only does G&L have plenty of genuine Leo Fender DNA, but the tweaked recipe makes for a different sonic stew that, for a Fender guy, could well augment more classic designs. Yes, there is some time-warp vibe - we guess you could now call that ‘vintage’ - but it’s simply the excellent feel and those different flavours that kept us playing it. In fact, this is the sort of guitar that the more you play, the more you discover. It covers a lot of tonal ground and to some extent blur the lines between single coils and humbuckers; it has a low noise floor, which could help in recording or higher gain situations, too.